At the considerable risk of Larrington reverting to a view of what I am bonkers in, behold, I shall now state that I have taken to wearing a bra. I have taken to wearing a bra as a result of retail mismanagement and my wife's mendacity. I used to have one of those - er - wossname - Trek thingies that you stick on your head, a sort of hat with the skullcap missing that makes you think a Jewish person from Golders Green visited the shop with a pair of scissors just before you got there and nicked the crown for his Saturday's devotions. - Headband. - A headband, that's the word I was groping for. I got cold ears so bought a Trek headband and my wife thought it so excellent a garment that she nicked it. I went and bought another headband. She lost the first and nicked the second. She denies losing the first because she is a Big Liar, and she denies nicking the second because she is Another Big Liar. It still being cold I went to the bike shop and behold! no headbands. The sports shop yielded big thick furry headbands such as won't go under helmets, and in New Zealand helmets are mandatory by law. (This is because the politicians here believe head injuries among cyclists are frequent. Head injuries among motorists are statistically more frequent but motorists do not have to wear helmets because politicians drive cars and wouldn't be seen dead in a car with a bicycle crash helmet on. Hey! A humorous joke has just occurred to me involving the phrase 'wouldn't be seen dead' but I will not trouble the Internette with it because I'm kind.) I went to see Jim and behold! even more No Headbands. Jim runs the bike shop in Richmond and also runs Cycling Nelson which is all about racing and whatnot, and in defiance of the UCI he encourages recumbents at all Cycling Nelson events, which is a bit of a bugg - a bit of a nuisance because now there's no excuse to avoid training. So then it went through my mind that since sawn-off socks, extracted from the bin after my wife has been through John's washing, make convenient ankle warmers, perhaps there was a garment that might make a convenient ear-warmer. 1. A piano score of Joseph and the Amazing Technicolor (sic.) Dreamcoat. 2. A pile of clothing. 4. Another pile of clothing. 7. A Harry Potter DVD. 9. A tin containing 22 cassette tapes. 11. Another pile of clothing. 12. A paperback: Popular Card Games. 15. An office chair with a basket of washing on top. 16. A plastic bag, containing clothing. 17. A graph of a parabola. 18. A hardback: Pride and Prejudice. 19. A bag of miscellaneous paper shapes. 20. A chessboard with two brown sandals in the middle of it. 22. Half a history essay. 23. A plastic bag of university prospectuses. 25. An English exercise book. 26. A physics exercise book. 27. A lunchbox, containing last week's wrappers. 29. A pencil, pen and calculator. 31. A loudspeaker attached to the bedpost with the string from a kitbag, the kitbag still in situ. 32. A straw hat and a resuscitation doll. 33. A Fawlty Towers DVD. 34. A used chocolate cake plate. And - handy to have teenage daughters in the family - I found a - well, a garment. Which garment, after suitable modification with scissors and thread, does not betray its origins when I cycle up the Mot Valley with it wrapped round m'lug'oles. 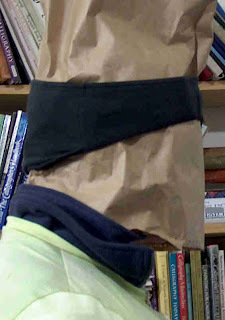 An anyonymised cyclist wearing 1. a brown paper bag and 2. a bra round his ears. You may depend that I have no intention of disclosing any of this to anyone at all. Altogether too many BHPC members would howl jubilant derision. But at least there is a reduced likelihood that my wife will nick it.